Well its that time again. Five months of only working is over and it is back to part time work, and full time study. Oh joy. Actually I have been very excited for Fall semester to start. It is a whole new semester for me. I moved to an amazing apartment complex called South Gate (maybe I will post pictures soon), I'm back into the 7th stake which actually has sacrament meeting first, and I'm liking the classes I'm taking. I'm not liking the fact that financial aid is taking forever and that I had to spend a ton on books, or the fact that even though I live a great apartment I now have to drive to campus, because I live out in the boonies. Oh well. I can't get lucky on everything. I am also taking an online class, Medical Terminology. 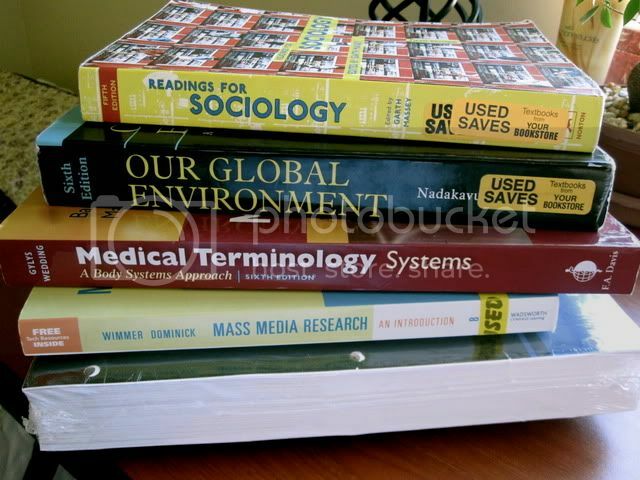 Its a full load for me this semester; 18 credits. I'm back to my normal spot in the Library. If anyone needs me they know where to find me. Hehe! I've already had some fun this semester though. Idaho Sate Fair was this week so I went with Layne, his brother Kirk, his sister Jill and a couple of her roommates yesterday. Mom, Dad you should be proud of me, I went on some rides that I have in the past refused to go on. Layne laughed at me the whole time because I kept my eyes closed and I screamed my head off. It was fun though. I don't have any pictures, but maybe when Jill posts hers on facebook I can steal them from her. You didn't ride a roller coaster did you? That would be amazing! I hope that Laynes sister took pictures!